Boat building was Wheeling’s first major industry and Flatboats would be the mainstay of Wheeling’s boat building well into the 1840s. 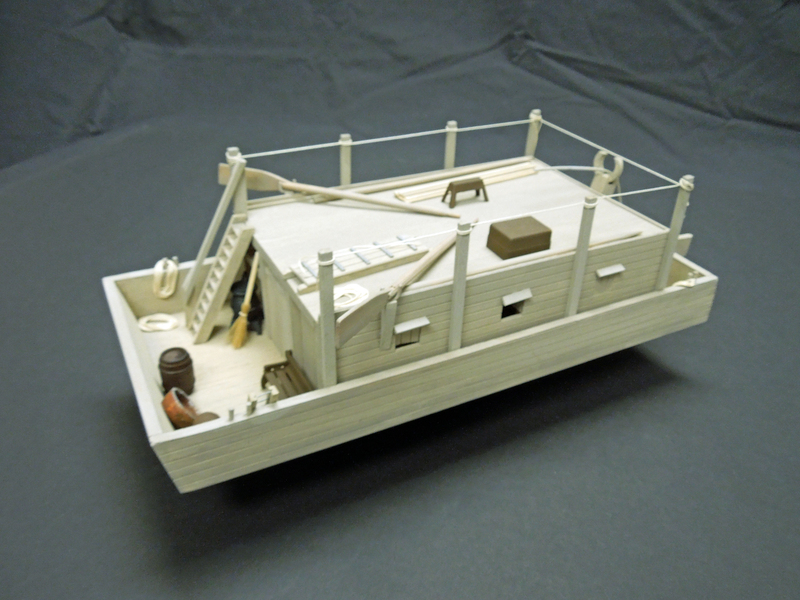 Flatboats were barges with a cabin or shanty built inside that served as living quarters. They were one-way crafts; at the end of their journey, they were dismantled and the wood was used in the building of more permanent structures. The earliest boat building west of the Alleghenies was centered in Redstone Old Fort, now Brownsville, Pennsylvania, where boat yards were building flatboats and barges. Many pioneers heading west began their journey there, purchasing a flatboat to move their families and possessions. Wheeling’s first families arrived here in flatboats. Ebenezer Zane, Wheeling’s founder brought his family here in a flatboat. In the spring of 1770, Ebenezer Zane placed his family, provisions, furnishings and effects on a flatboat and set-off down river. He was accompanied by a second flatboat containing his livestock, his slaves and the laborers that tended his livestock. From 1800-1820 as many as three-thousand flatboats a year went down the Ohio. Wheeling’s flatboats were selling for $1.00 and $1.50 per foot depending somewhat on the width desired. The average price for a flatboat of fourteen by fifty feet was $75; this included one steering oar known as a sweep, two rowing oars and two pike poles used to extricate the boat when it became grounded.